Three images taken yesterday (25.11.12.) from Overton (Frodsham) Hill looking down to the marsh. Panorama of Frodsham Marsh from Frodsham Hill. WSM. No 6 tank (and pointers) from Frodsham Hill. View of Mersey and Weaver Estuaries, No 1 tank and flooded fields east of No 5 tank. All images WSM. Red Lane , Frodsham cottage (photographer unknown). The above photograph was taken around the late 1800’s and shows cottages on Red Lane, Frodsham. The image is also published in Paul Hurley’s ‘Frodsham and Helsby Through Time’ where he suggests that the bird cages hung on the external walls are Linnet cages. The term Linnet was quite generic at this time and referred not only to the European Linnet (Carduelis cannabina) but other passerines such as the Goldfinch (Carduelis carduelis) which was known as the Red Linnet, and the Greenfinch (Carduelis chloris) which was known as the Green Linnet, all with a sweet song and easily trapped by using a decoy bird in a trap or more likely birdlime, a thick adhesive substance prepared using a variety of methods including boiled up bark, mistletoe berries and even linseed, ironically the food that the Linnet takes its name from. The Linnet derives the latter part of its binomial name – cannabina – from its fondness for the seeds of Hemp, and its English name from its liking for Linseed, the seeds of Flax (Linum usitatissimum). Flax and Hemp were favoured plants for the textile industry as their strong and flexible fibres suited requirements for fabric. The linen trade was so pervasive that it would have touched many people’s lives in Cheshire. Not just production, harvesting, and transportation but it’s washing at water features that still bear the association in their names; Lin-mere and Flax-mere. Goldfinch (Red Linnet). Image by Andy Harmer. Frodsham and its hinterland would have been perfect for these passerines in the late 1800’s and the report that ‘the linnets’ were trapped on Frodsham Marsh fits with the habitat that would have been there at that time. The construction of the Manchester Ship Canal in the latter half of the 19th century would have required a development footprint a lot wider than the actual cutting and the disturbed earth and new spoil distribution would soon be covered in ruderal vegetation. A lot of excavated spoil would have been transported out to earmarked places such as Mount Manisty, a large mound of earth on a narrow stretch between the canal and the Mersey northwest of Ellesmere Port. Both this and the adjacent Manisty Cutting were named after the engineer in charge. Greenfinch (Green Linnet). Image by Andy Harmer. The colonising plants, or ruderals, making up this pioneer community would have persisted for many years after completion of the canal and provided an abundance of food for the ‘linnets’. Mayweed, Chickweed, and Dandelion all have seeds that make up part of the diet of these birds, but Teasel and Thistle are particularly favoured by the Red Linnet (Goldfinch). These ruderal habitats would no doubt flank the canal for its entire length. Geoffrey Egerton-Warburton, a Rector from Warburton near Lymm mentions in his natural history notes from the late 1800’s that “despite County Council orders, Red Linnets (Goldfinches) are being caught on the rough ground next to the Manchester Ship Canal and earning the trappers several shillings per week”. 7 Raven continue to settle down with a group of 5 Common Buzzard on No 5 tank. The Lapwing, Golden Plover and Dunlin flocks were constantly disturbed from the resting/feeding areas by weekend pheasant shooters from the fields adjacent to No 6 tank. Guido enjoying his desert. Image by WSM. I very rarely get to go on a ‘twitch’ these days but, when Guido offered me a lift to Rhyl in North Wales to see the Desert Wheatear than resistance was futile. I thought you might like to see how tame this little beauty performed today. No excuses except it was a little quiet at ‘Frodders’. Guido found an Iceland Gull at Llandulas and 8 Velvet Scoters were the highlights from watching the hundreds of Common Scoters leap frogging each other in the feeding waters off shore. 1,200 Lapwing, 500 Golden Plover, 120 Dunlin and 2 Redshank on No 6 tank. 4 Raven and 80 Redwings on and over No 5 tank. 6 Goldeneye on Weaver Bend, The usual flocks of Teal, Wigeon, Shoveler, Pintail, Pochard, Mallard & Tufted Duck were on No 6 tank. Golden Plover, Dunlin & Lapwing were also present. 1 Stonechat at Marsh Farm, c150 Redwing & 150 Fieldfare along Brook Furlong Lane including Sparrowhawk and Jay. 7 Raven were on No 5 tank. I found (or should I say they found me) a flock of 25 Waxwings which I observed flying directing over my moving vehicle adjacent to Picow Farm Road Recycle Centre, Runcorn this morning (9.10ish am). Fortunately, they settled briefly in two Cherry trees (minus cherries) before moving on south. Later in the afternoon I had another flock of 12 in flight heading west along Astmoor Road, Runcorn at 2.20 pm. High tide on the river this weekend. Sheep, Raven and Hale lighthouse from Marsh Farm. Image by WSM. Frodsham Score: 4 Little Egret 1 Great White Egret and 3 European White-fronted Goose on Frodsham Score (1 sub adult and 2 juvenile). Also present the wintering 8 Whooper Swan on the Score and Ince Marshes. Farmyard Goose 2 (white birds). Hybrid White-front x Canada 1 (Looked like White-fronts from back, but Canada from front. Pale face, pink bill, size of Canada). Canada Goose ,1300 but all not seen. Canada Goose 1 with white rear hind neck. Shorbirds noted were 1 Grey Plover, 1 Black-tailed Godwit and 250 Dunlin from the tide on the Score . On the banks of the Manchester Ship Canal were a single ‘wintering’ Common Sandpiper and a possible Rock (Water?) Pipit, 1 flew west along the Ship Canal calling at 13.55 hrs (a big, rangey pipit and typical call but into the light). Also 2 juv male and female Goldeneye on the canal. Lapwing 930 on No 3 tank and 600 on the Frodsham Score (no idea if same birds). Curlew 70 No 3 tank, 40 Frodsham Score. Golden Plover 110 No 3 tank, 300 No 6 tank later at dusk. Kestrel 1 No 1 tank 3, 1 No 5 tank, 1 Frodsham Score. 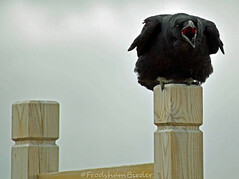 Merlin sat out on posts on Frodsham Score. Raven 10 on No 5 tank, 15+ Frodsham Score. Redwing 100+ Brook Furlong Lane plus 15+ No 4 tank. Fieldfare 50+ Brook Furlong Lane. Blackbird 20+ Brook Furlong Lane, 20+ elsewhere. Linnet 20 Brook Furlong Lane, 60 and a 40 on No 6 tank, 80 frodsham Score (200+). Redpoll sp 2 No 4 tank. Marsh Harrier (immature) over Redwall (water meadows) then flew to Marsh Farm and beyond. Reed Bunting at the Pumping Station reedbed. Image by Tony Broome. 5+ Jays, Goldcrest, Great Spotted Woodpecker also, Male and female Brambling with numerous Chaffinch in Godscroft Lane, Frodsham and Helsby Marshes. Male Sparrowhawk at dusk today along Godscroft Lane. Image by Paul Crawley. Male Brambling at feeder. Image by Paul Crawley. Foraging Jay. Image by Paul Crawley. 7 Waxwings in a hawthorn hedge along Brook Furlong Lane at 10.00 am (SM). Brook Furlong Lane (birdlog track), where the Waxwings were present this morning. High tide saw 768 Common Teal, 32 Shoveler, 11 Pochard, 9 Tufted Duck, 6 Gadwall and 8 Mallard. Wader wise Golden Plover mustered an impressive 800 in various flocks. 62 Grey Plover, 1,700 Dunlin ,16 Knot and 6 Common Snipe. Adult Peregrine selecting from the duck menu on No 6 tank. Image by WSM. With all these waders and ducks about they attracted an adult Peregrine and, a persistent Merlin. The latter species spent a good ten minutes detaching a Dunlin from the main flock and veer it towards Frodsham Hill and out of sight. Presumably it was unsuccessful because, it was attempting the same thing with smaller prey when it was harrying a Goldfinch flock on No 5 tank later. A Sparrowhawk fared similarly in the open on No 6 tank and barely caused a flutter with the Teal feeding there. 16 Raven on No 5 tank and 5 at Marsh Farm and these five moving to the score soon after. Mixed flocks of 200 Linnet and Chaffinch were field hopping. 700 Fieldfare and Redwing were unsettled and continually on the move. 14 Stock Dove, Jay and a Grey Wagtail were in fields by Ship Street. A dog Fox stealthy worked its way through the tall grass on No 5 tank. Observers: Stuart Maddocks, Arthur Harrison, Frank Duff, WSM.